After 10 years with our old couch, it was finally time to bid it farewell. It was a great couch, but it had been through a ton between our kiddos and pets. When our dog went to live with my mom on her farm (where he is truly happy, running around with the horses and swimming in the pond), we started looking at sofas. 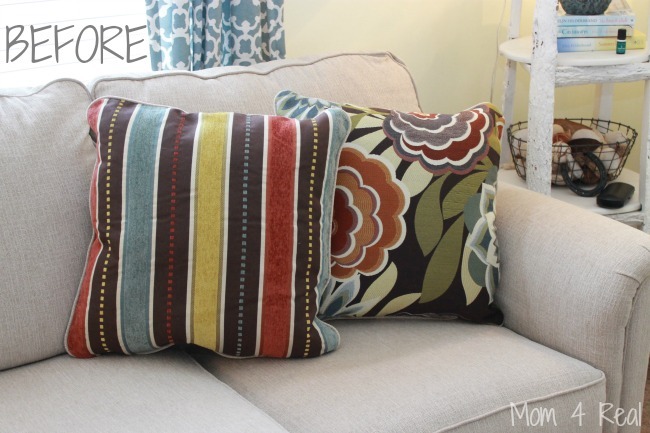 I found one that I love, but the throw pillows didn’t fit our taste or decor. 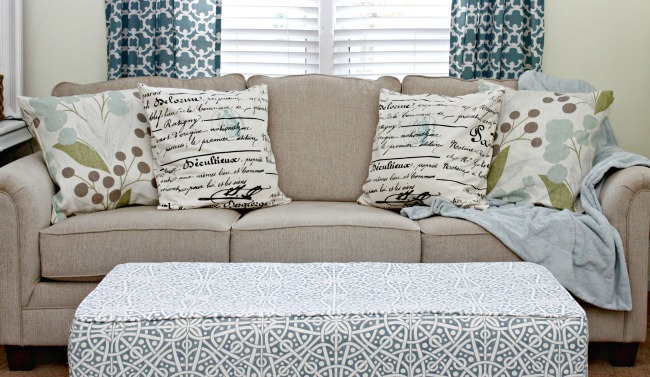 I loved this couch so much that I decided to buy it and recover the pillows. 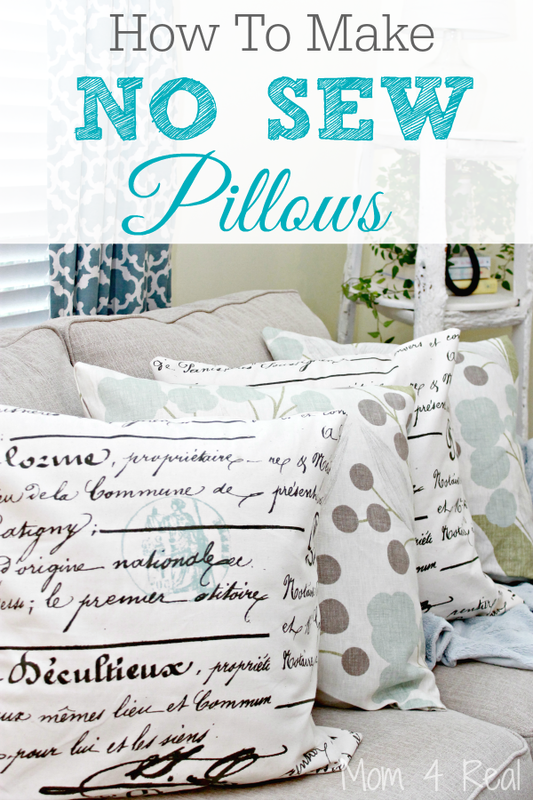 This time, I decided to take the easy route and make no sew pillows, and I’m so happy I did! I got them all finished in under an hour and they look amazing! 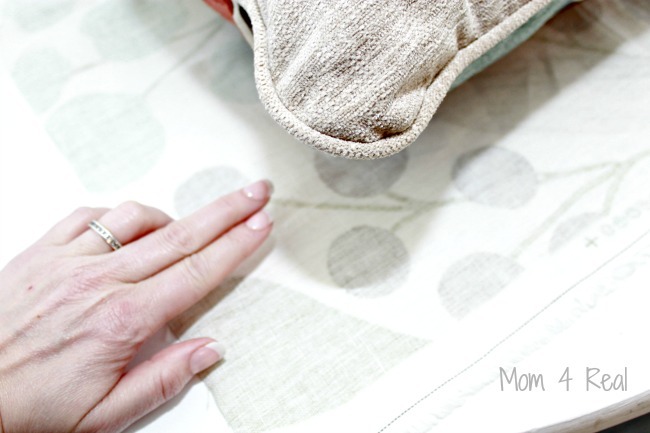 Today, I want to show you how easy it is to make your own no sew pillows! 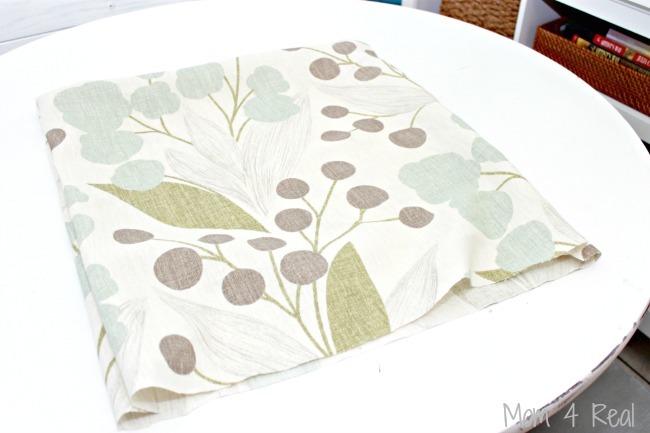 I picked out some gorgeous fabric from Online Fabric Store that I thought would go together nicely and match our decor. 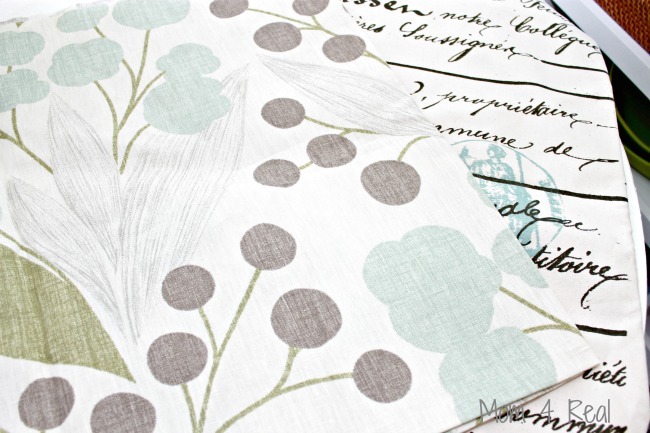 I like to keep it nice and bright in our kitchen and dining area, but like more muted colors for our living room. 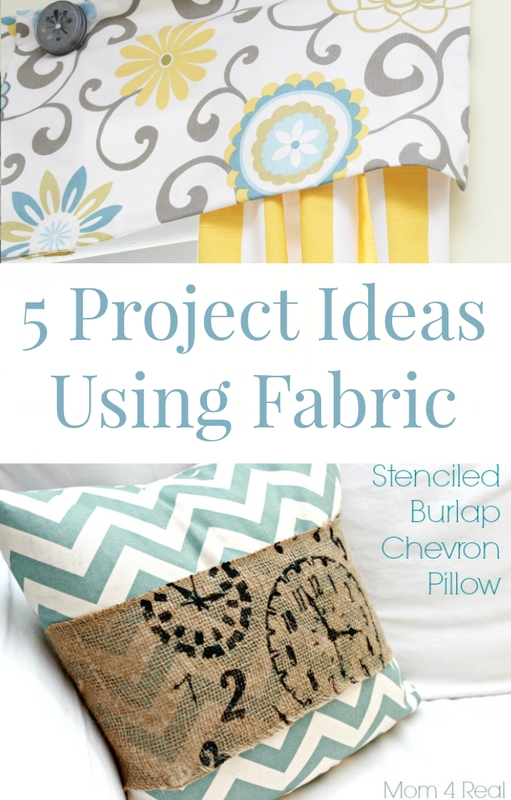 Start by cutting two large square per pillow. I’m not going to give you my measurements, because all pillows differ in size a bit. 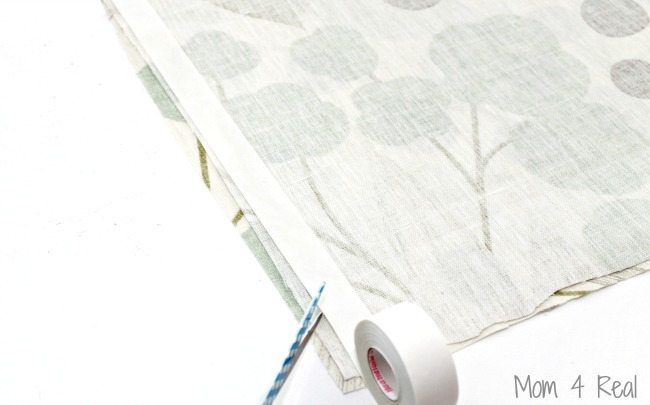 You will want to be sure to leave a couple of inches all the way around since you will be bringing fabric pieces together. 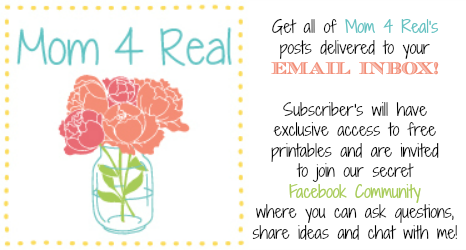 Here is my no sew trick…Stitch Witchery! Now, let’s make our pillow covers! 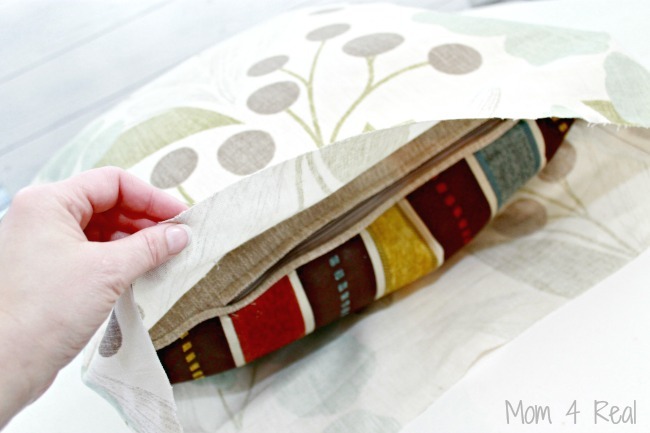 Simply place your fabric pieces right sides together. This way when your finished, you can turn it right side out and you won’t see the seams. Now take your Stitch Witchery and measure and roll it down one side. Cut it. Now lay it in between your two pieces of fabric. Remember…they should be right sides facing each other. Peal the tape back leaving the clear part running along the edge, then lay your top fabric down. Iron the two pieces together. 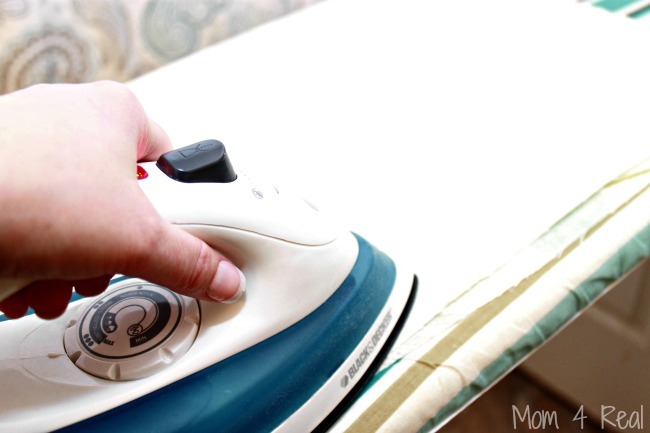 Your iron should be on the wrong side of the fabric. 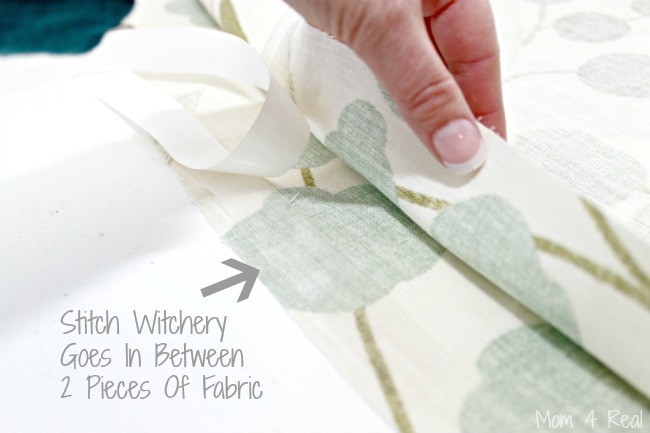 The heat will cause the Stitch Witchery to melt in between the right sides of the fabric, bonding them together. Now follow the same steps for two more of the pillow sides, leaving one open. Gently pull your fabric right side out. 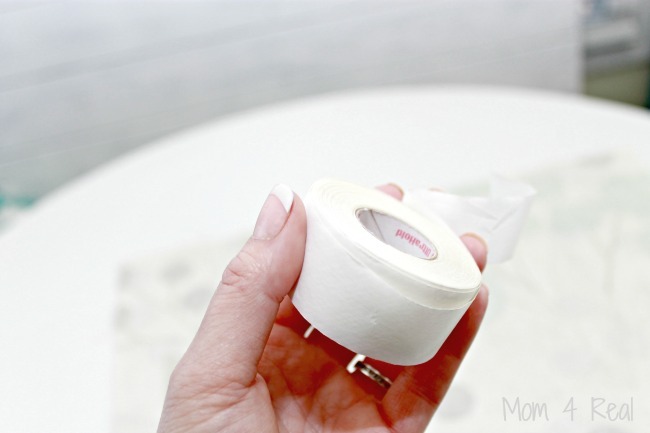 Use your fingers to gently poke out the corners. 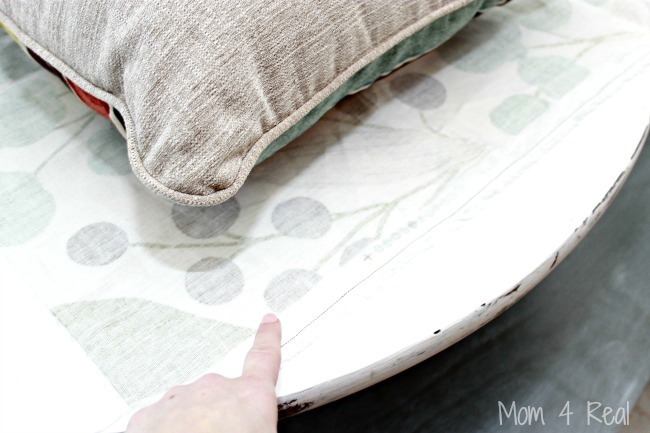 Slide your pillow, pillow form or stuffing into the pillow sleeve. Now, fold in the edges on the top and bottom of the opening. iron to get a nice crisp line. Now you can either iron it shut using the Stitch Witchery or you can do what I do and run a bead of hot glue down the middle while pressing the two pieces of fabric together to close the opening. I just feel like it’s a ton easier to use hot glue here. I love the way they turned out, and I also love that you don’t have to own a sewing machine or have any real sewing skills to make these! My couch is happy and so am I! 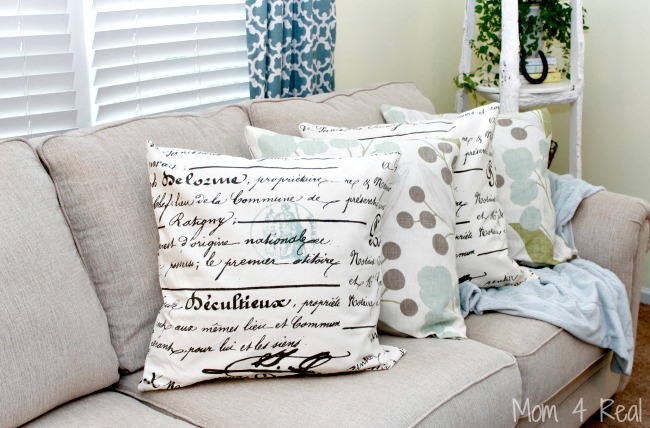 The fabric choices that I used for these pillows are Portfolio Capparis Spa Fabric and Premier-Prints Penmanship Village Blue/Natural Fabric! 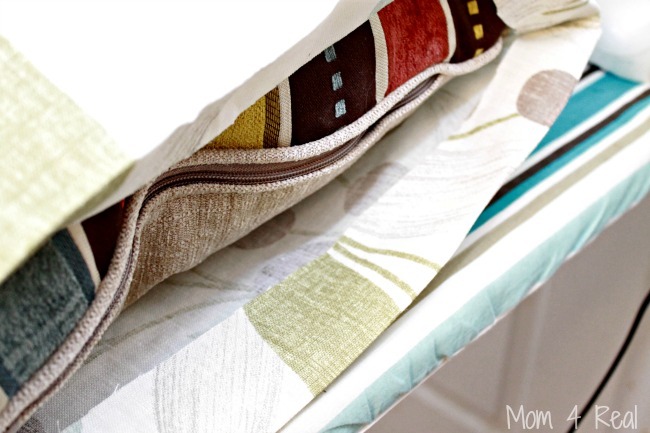 I get all of my fabric from OnlineFabricStore.net…they have such beautiful fabric at great prices…you can see more of the projects that I have done using their amazing fabrics below!